In this photo, taken on Tuesday, smoke rises from a fire at the Intercontinental Terminals Co. near the Carpenter Elementary School in Deer Park, Texas. The blaze briefly reignited on Friday. The cause of Friday's fire is still unknown. There are no reported injuries. "The fire caused the release of several air contaminants, including benzene. Most of the chemicals identified in the fire are used in the production of gasoline, and short-term exposure to their fumes can cause fatigue, dizziness, and headaches. 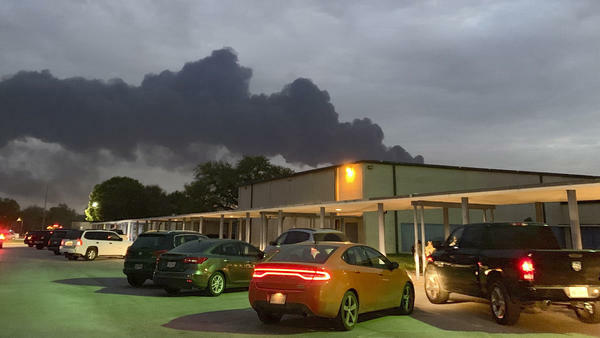 Twice this week, residents of Deer Park and neighboring Galena Park were told to stay indoors because of concerns about unhealthy air quality. Those concerns also prompted Deer Park ISD and several other districts to cancel classes for several days." Friday's reignited blaze occurred after a breach in a containment wall around the tank farm spilling chemicals and prompting the Coast Guard to temporarily shut down traffic in a part of the Houston Ship Channel, the site of the nation's busiest petrochemical port.